What do 33 years of leadership experience, 5 years of research, a trip to India and over 20 thousand people have in common?… a confirmation that every one of us is responsible to reach out and put our compassion into action. Compassion is not a commodity: you can’t trade it on the stock market, it does not come with an expiration date, nor is it of limited supply, and therefore, you cannot lose it when you use it. Whether you are a parent proudly wading through the teen years, a leader dedicated to genuine service delivery, a passionate community volunteer, or anyone who believes that actively giving of yourself changes the world then inspiring yourself to take personal responsibility is crucial. In this inspiring keynote OLIVIAMCIVOR brings experiences and lessons from her research in India and her experiences with clients across North America. Olivia will remind, inspire, and lovingly provoke everyone to take action and turn their compassion into actions in the workplace. Whether you are in healthcare, retail, resources or in the financial sector everyone is waking up to the stark reality that generational values are transforming how we work. OLIVIAMCIVOR has spent a lifetime researching what separates truly passionate engaged teams and leaders from the rest of the pack. Based on her groundbreaking work in her bestselling books, The Business of Kindness: creating work environments where people thrive and Four Generations One Workplace: sharing in the information age, McIvor reveals the secrets of how to win and engage the multi-generational workforce. The Millennial, and how to harvest the best from these fast paced up and comings, the Boomers, how to retain their wisdom, their history and their ironclad success stories, the Gen Xer, how to engage them, keep them and nurture their leadership and the Pre-boomer, how to remain connected to these soon to be out of reach mentors who have the time to share their knowledge. Ms. McIvor inspires, engages and leaves you ready to create sustainable synergy in your workplace. 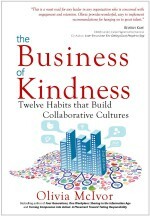 This inspirational and thought-provoking session by author OLIVIAMCIVOR, brings to life the value of ‘kindness” at work through the discussion of the 12 Character Building Traits that raise one’s self-awareness and personal accountability for the development of a respectful and caring workplace culture. Kindness as a core value, and as standard for decision-making, provides an easily understood ‘emotional benchmark’ for recharging and centering oneself in the midst of stress and the daily changes in today’s workplaces. This session will ask participants to take personal responsibility to build a more caring and positive workplace culture – one person at a time - and to choose to live a kinder and more generous life regardless of whether you work in a large corporation, own a small business, contribute in the non-profit sector, or as an individual member of a community. Our society is built on a foundation of relationships, which connect individuals to families, work environments and communities. From playgrounds and courtrooms, to our staffrooms, trusting relationships lie at the heart of our challenges as well as our solutions. The way we affect each other relates to the quality of our interactions and ultimately determines the wellbeing and success of our personal and professional roles. Olivia will remind you to celebrate accomplishments from your own organization and to tap into increasing your positive interactions with one another. Guaranteed she will inform and makes a promise you will leave inspired to be the change you want to see in your workplace, empowered and ready to act! Based on her work with many healthcare clients across Canada and the United States who are moving towards Patient and Family Centred Care approach to service delivery, Olivia is often asked to present her work that has assisted in the transformation of service cultures to compassionate cultures. Health organizations are working hard to improve the individual’s experiences by providing exceptional compassionate care that is consistent with best practices to exceed patient and client expectations. It is in the merging of regional values into compassionate principles that serve as the foundation to create a system focused on heartfelt care where the needs of their patients and clients come first. The goal of values is to be a guide among all members of the care team—health care providers, facility staff, and leaders. For values to be meaningful they must be owned at a personal level and then be ignited and integrated into performance management where standards of behaviour must be clearly set and continuously promoted. Being present knowing that anyone is the only one in that moment. The way we affect each other relates to the quality of our interactions and ultimately determines the wellbeing and success of our workday and our lives which can then translate over to creating an exceptional patient and family experience. Olivia McIvor has career in HR and leadership development researching what separates truly passionate collaborators and engaged teams. Now, based on her groundbreaking work in her bestselling books TheBusiness of Kindness: creating work environments where people thrive and Four Generations One Workplace: sharing in the information Age, McIvor reveals the secrets of how to win and engage the emerging workforce while leading your team to take their performance to the next level. Developing a collaborative culture is something that happens intentionally when teams work in cultures that cultivate trust and cooperation by consciously tapping into the wisdom of the group to solve complex problems thus allowing for them to pull ahead collectively in times of difficulty and challenge. Building collaborative relationships explores the necessary elements employees need to maintain a culture of excellence where everyone is committed to maintaining effective relationships across the spectrum of stakeholders and where everyone feels valued, respected and willing to give their best. Based on Olivia McIvor’s book, Four Generations One Workplace: Sharing in the Information Age this session touches on employee engagement, diversity, ageism, and creates a fabric of understanding and respect. With multiple video clips, colorful PowerPoint, compelling research and humours quips ‘Four Generations’ promises take the mystique out of how to interpret, interact, and get the best from the range of individuals in the workforce today!. Whether you are leader or a member of a team, everyone is aware of the generations in the workplace today, however it is often tainted and biased. This program is designed to bring to light the best of each generation and the gifts they bring to the workplace. It isn’t our differences that divide us but the judgments we have created about one another that creates a lack of cohesive efforts. Olivia will make you laugh, will provoke you with data and have you understanding at your colleagues in ways that create positive results. Learn to Develop, Engage, Collaborate and Keep the people you need!